No matter what the era, the themes, the characters, or the plot, a Guy Gavriel Kay is always a marvel of narrative construction. Few authors can weave a tale in quite the same way he does, building a narrative that engages as effortlessly as it flows, and yet which is revealed to be a thing of complex beauty upon further reflection. A Brightness Long Ago is a story told in offset layers, with one narrative thread overlapping another, repeatedly taking us back a step to view a portion of the scene from a different point of view before advancing further. It's a technique that could be jarring, disconcerting even, but in Kay's hands it enhances the story, building connections with the characters even as it builds our appreciation for what he's accomplished. It's not just a story of overlapping narrative threads, of course, but one of overlapping lives, and there is where the brightness shines strongest. Guidanio Cerra is at the heart of it all, a young man who comes into some very powerful, very dangerous circles. On the surface, it seems like a matter of right place, right time, but the more we read, the more we realize it's his choices - sometimes the simplest of choices - that guide him into those circles. The first circle he steps into is that of Adria Ripoli, a young woman about to assassinate the Beast. The lead-up to that act, the act itself, the escape, and the circle that follows, bringing Jelena, the healer, into the story, is more exciting than many novels, and that's less than 60 pages of a 560-page book. The two biggest, boldest circles are those of Folco Cino and Teobaldo Monticola, rival mercenary commanders with a history. It's a rivalry that threatens to spill over into battle, with the threat of war looming large over the whole story, and yet that's not the focus here. Kay can do battles, sieges, and conflicts very well, but here he is less interested in the action and more in the motives, the relationships, and the personalities. The crossing of their circles is alternately amusing and tense, playing out over the turning of seasons, until it does finally come to violence. A smaller circle connecting both men, drawing Guidanio deeper into intrigue, is that of Ginevra della Valle, a beautiful Mistress who alters the course of fate with a word, a wink, and a wager. Whereas so many fantasies are all about the story, with a quest or a conflict driving the story, we don't have that thread to follow here. 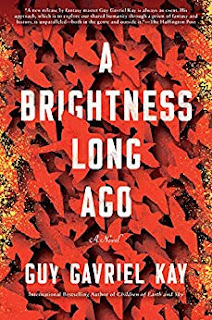 Instead, A Brightness Long Ago follows the threads of the characters and their relationships, becoming more about the act of choosing than the choices we make, and more about the nature of memory than the memories we keep. Those overlapping circles, narratives and characters, are what make the story here, and it's a powerful one. By the time the story reaches its climax, it's almost shocking to see the way in which fate changes everything, and how the choices we make sometimes may mean everything to our lives, but nothing to the world.